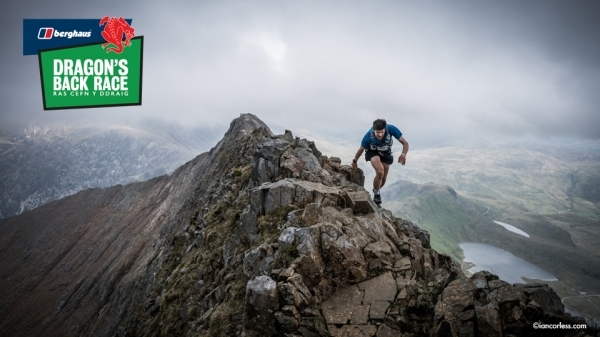 Anticipation is building as the world of mountain running turns its eyes to Wales and the return of the legendary Berghaus Dragon’s Back Race® in May. The 2019 race will be the biggest ever, with 450 anticipated starters from 32 different nations. Starting from Conwy Castle early on the morning of Monday 20 May, each of them will be striving to earn a coveted Dragon by completing 315km and 15,500m of climbing over five testing days in the wild and remote Welsh mountains. This year’s Berghaus Dragon’s Back Race® has already broken new ground. Places in the race filled up in record time and more countries than ever will be represented on the start line. Organisers are now making final preparations for the huge logistical challenge of building a race HQ that can be moved about 40 miles south each day. Along with 100 volunteers, the race team will take scores of Berghaus Air 8 tents, several large marquees, 9,000kg of participants’ kit, 220kg of baked beans, 630kg of chips, 160kg of fresh fruit and much more to Wales. Each day, the entire race HQ will be taken down, transported and set up again for the next overnight camp. As the 2019 Berghaus Dragon’s Back Race® looms closer, participants will be planning the finer details of their race strategies, whether they expect to be at the front of the field or simply hope to complete each day within the challenging cut-off time. In an event that has been infamous for its very high rate of drop-outs over the years, anyone who finishes five full days within the allotted time will have achieved something very special and truly earned their Dragon. Sponsored by Berghaus, the Dragon’s Back Race takes place every two years and has a global reputation as one of the most spectacular and challenging mountain races on the planet. The event has tested – and bested – some of the world’s very best adventure races, while for others, simply completing the race has been a career highlight. For more information about the Berghaus Dragon’s Back Race®, visit www.berghausdragonsbackrace.com, follow @DragonsBackRace on Twitter and Instagram, or find the event on Facebook. Details of how to follow the race live will be revealed in the lead up to the start in Conwy Castle on Monday 20 May.